It's finally done!! My sewing room in the basement was flooded on October 20th. I didn't plan this post to be today, but it's November 20th and it's been one crazy month. My sister was the biggest help to us throughout the whole process and I thank her from the bottom of my heart. She really pushed to get this done, because she knew I was at my wits end...especially with the flood part. I've never told you, but my dad (who lives with us) has flooded our basement 4 other times before this. Two times he put a big soup pot in the sink to fill it up and walked away for hours and never checked it. Because the pot was covering the drain, the water just over flowed and rained in the basement. The 2 other times I won't even get into. I thought my sewing room was in a safe zone down there, but there is no safe zone from an 85 year old forgetful man. LOL!! I needed to move back upstairs some where and my only option was a room we have that connects my dad's kitchen to our family room. It 12' x 24' and we use it for all our family functions. When my family and my husband's family get together here for most holidays, there are over 40 of us, so this room is used a lot. It had 2 big long tables, bookshelves and a buffet for serving food. Well, we clear everything out, brought up old furniture from the basement, cleared all the books out of the bookshelves and my sister and my niece gave me 3 butcher block tables...and this is what we did. my sister is a master at adding crown moulding to anything to make it more my style. She used left over crown moulding from her house projects. the only things we purchased was 3 sheets of bead board for the back of the bookshelves, pipe straps for all the handles of the boxes, foam letters for my name, cork board, and a gallon of black paint. My sister brought some other things from her house that she said she "had", but I know she lied and bought them for me out of sympathy! I just didn't want her to spend any more money! This view is from the door from our family room looking in. That's my dad's kitchen door in the back. The door from our family room is a French door, so you can see in...I have to keep this room clean. Yikes...wish me luck on that. The table to the left is my work/craft table, the center hutch is storage and that's my computer desk to the right. 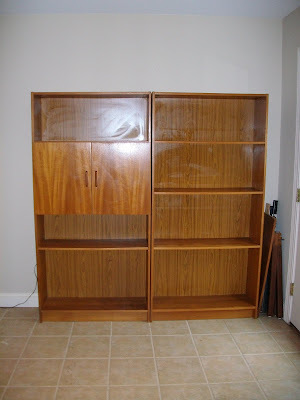 This unit was made from three old cheap bookcase. We replaced the back flimsy backing with bead board, my sister added the top wooden boxes to make them taller and then added crown moulding to tie the 3 together. Paint, paint and more paint! These are the boxes from one of the TTT when I used the pipe straps. These hold all the different colored scraps of fabric. This is another piece that I painted. 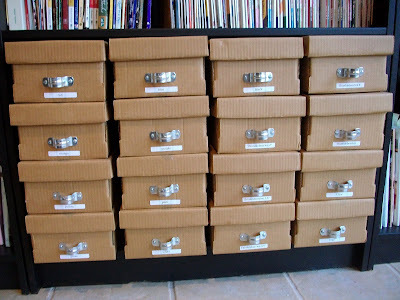 It stores all those boxes I had in my sewing room. Each one is labeled with something. hot glue gun and drill are already set and plugged into a surge bar, so all I need to do is click a switch. The surge bar is attached to a lamp, so if the lamp is on, I know the hot glue gun is still on. Safety feature for me. the little wooden drawers in the back hold all the little beads and screws. the galvanized buckets below are from Home Depot for $12. I bought those a long time ago to hold soda, bottled water and beer when we have parties. For now it holds my batting and polyfil. Easy to bring them back out for parties. The hutch is for storage. This is a super old piece of teak wood furniture that we had in the basement. Again...paint and crown moulding. Cereal boxes from a Tool Time Tuesday. I covered these with fabric on the spine, but painted the body of it black. 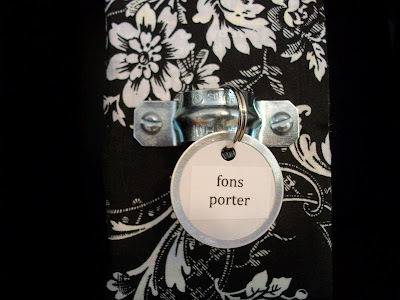 I used the pipe straps for handles and key rings to label. 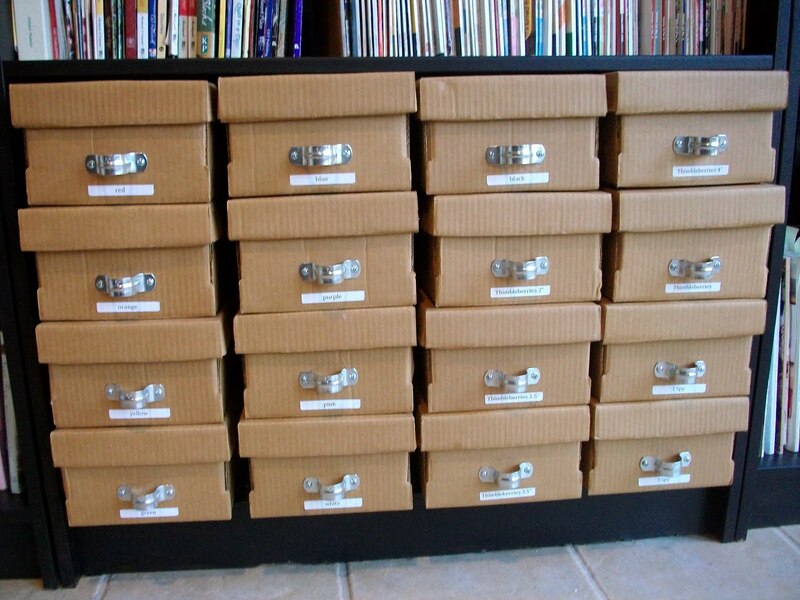 This is another recycled box project. Those are all the bottled water boxes covered in fabric. Still need 3 more. Same handles and key chains. This is my computer desk. The frame above is waiting for a piece of sheet metal from Lowe's. Our Home Depot didn't carry it. That will be a Tool Time Tuesday at some point. My poor desk misses the laptop. That poor computer didn't have a chance in the flood. This is on my desk. 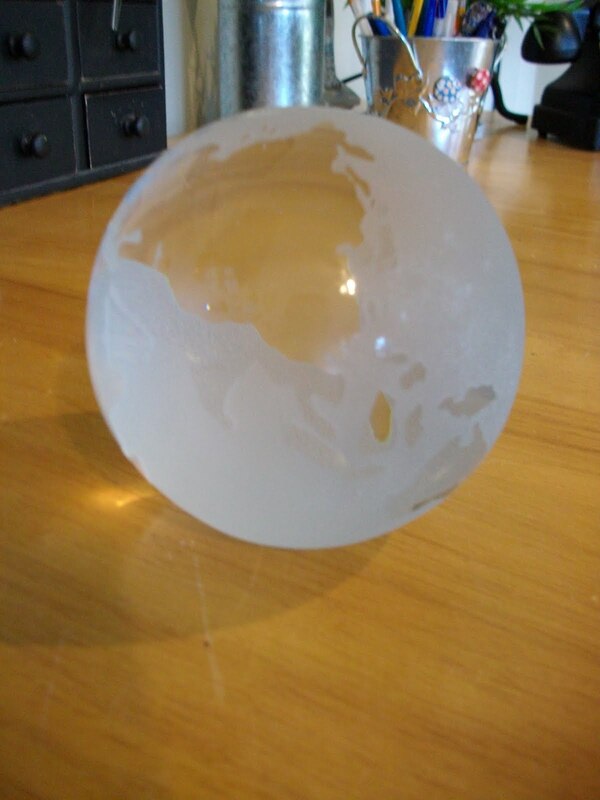 It's a globe paper weight. I had to buy this at a consignment shop. Every time I look at it, it reminds me of all the blogging friends I have made around the world. You have all made my world a better place...and I thank you from the bottom of my heart. This is my cutting table. Take a good luck at this now and all the other areas in this room, because they will never look this clean again. EVER. Even now as I type, this table doesn't look like this anymore!! 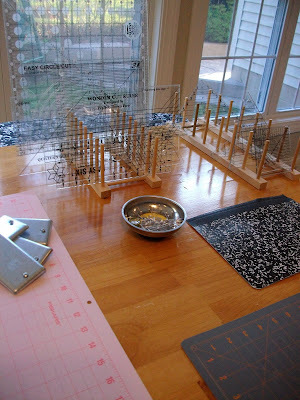 These are old plate racks that I use for my rulers. This is a mini DVD player that I watch the Walton's on all the time. This is from my sister. She bought it an office supply store for her work, but she doesn't use it. 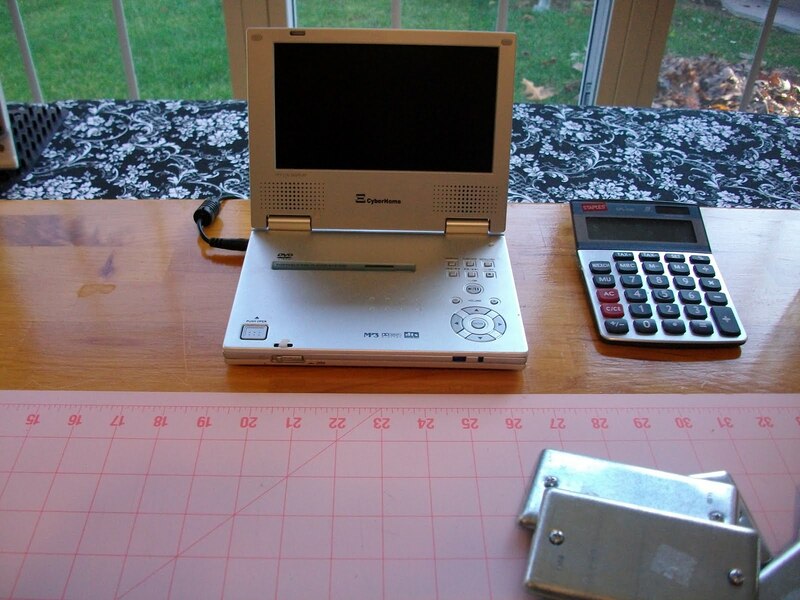 It's used to hold a paper as you type on the computer. I'm using it to hold a pattern as I'm cutting the fabric, so the directions are always there, not lost under piles of fabric. Here's my ironing board covered to match the fabric on the boxes. This is a super old fridge that we use for soda and water. I kept it in here...had to paint it though. 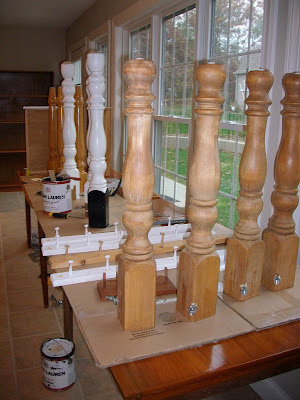 Here are other befores and durings...painting all the table legs. See the little bookcase in the back? This is the bookcase before...the third one isn't in yet. See the cheap backing, it's almost like card stock that looks like wood. This is a during picture before the shelves went in. That's the new bead board. 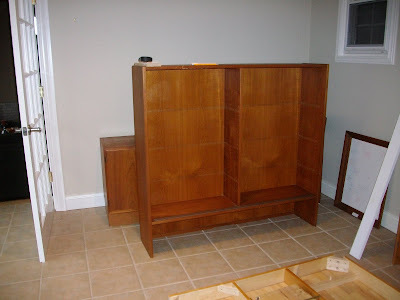 This is the before of the hutch when it was in the basement. We brought the top upstairs and added to a different bottom (the buffet that was already in the room). and here's a during picture of it painted. I hope you enjoyed the tour of my sewing room. This is why I've been behind on visiting all your blogs and trying to catch up on emails. Once the holidays are over and I buy my new machines, I'll be back in business. Some of you have asked how I made out with the insurance. The major things are covered like my Bernina, my serger and the computer, but with a major catch. Our insurance has full replacement coverage, but the only thing is, it has a "Hold Back Policy". This means they pay me for the "depreciated" value of the items up front, then I have 180 days to go out and purchase the new items, send them the receipts to prove that I purchased the same items that I lost and "then" they will repay me the difference. We also have a $1000.00 deductible, so I think I will be doing all of this after the holidays, because that means fronting a lot of money...which we don't have at the moment. In the mean time, I will borrow a sewing machine from my sister. I will try to take some pictures of our Thanksgiving when I turn this room back into a food buffet area. Shouldn't be too bad. I just need to store all the stuff that is on the top underneath and cover the three tables with tableclothes. Wish me luck. Thanks for all your well wishes during this time. I can't thank you enough for your love and support. Oh my Goodness your room is just gorgeous!!! Wow you have done a great job of putting things back together in such a short time. Thank you for sharing, I think you have inspired me to get studio updated. It needs it!! I too love the look of Black painted furniture. It looks so classic and clean. wow Karen, that's looking really good! You have been very busy indeed! Enjoy your new space, it looks very big, lucky you!! Love from Holland! You are the queen of organization! A beautiful sewing room. Love all those windows. Your room is so great even my 16year old daughter thought it was great. She did make a comment on how tidy it was and why mine never looks like that. 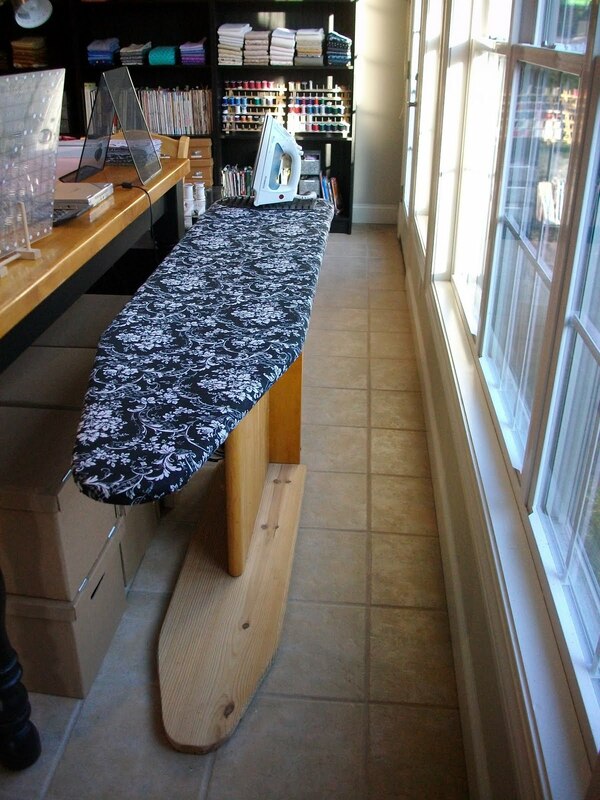 That is the most fabulous sewing room ever! Such great ideas for storage and those windows will be great for light. You and your sister sure did a great job. You're going to love sewing in your new room. Maybe now that you are upstairs you'll be able to keep an eye on Dad! LOL! Karen, Your new sewing room is beautiful! What a wonderful sister to help you through this tough time. I can't believe you got it done so fast. I wish many hours of joyful sewing in your new room. Oh Karen, it is absolutely beautiful!! I love it. And thanks for sharing all your wonderful ideas...I can see why you are definitely the "tool time" lady. It looks like you had so much fun (besides all the work) in creating your new space. Congratulations and I hope you enjoy many, many creative hours/days in it. The TTT girl needs and deserves a room like this!! Wow, your new room is incredible- you and your sister did an awesome job!! Love the way you painted everything black and love the crown molding!! Well done! Oh my goodness, your room is amazing! I love the before and after furniture pictures. WOWSA! It turned out so neat! You guys did a great job in record time! I could play in there for days. There's a fridge, right?! 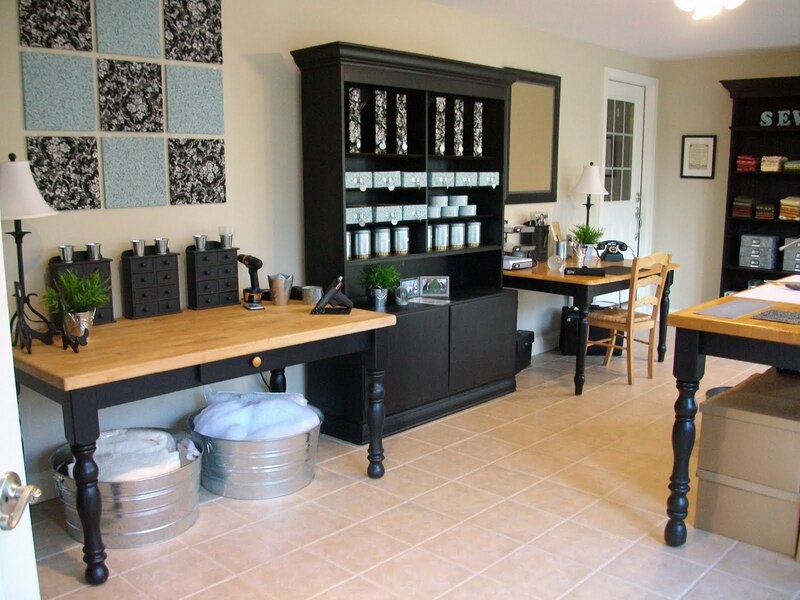 what a great job you did on your sewing room, such a good idea for the black - it really pulls everything together so well. You sure do come up with ideas - I wish I was like that! OMG! What a wonderful room! I hope you have many hours of creativity in there. 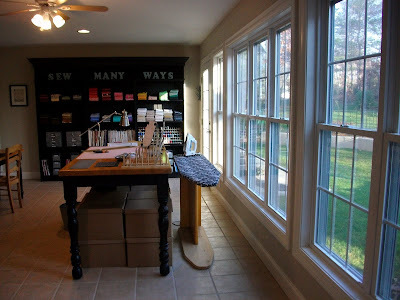 Your sewing room is amazing and very inspiring. We are redoing my little craft room these days (my boyfriend put a wall up yesterday and began plastering it today)and I may borrow some of your ideas for organizing my space. Your blog is one great source of information for using what we have at hand and turning "junk" into useful objects. Thank you so much for sharing all these pictures! What an absolutely stunning sewing room! I love everything about it! I'm glad you mentioned what happened about the insurance. It might be good to add a rider to the insurance is people have expensive machines so that they get full replacement and no deductible. Oh Karen, what a fabulous sewing room you have now, so well set out. A place for everything! I love the big windows for lots of light...I love everything..
You guys did so well...happy sewing there..
Oh Karen, It is just amazing, you both did a wonderful job. I felt as if I was reading a quilting magazine, with a before and after studio make-over. The windows are great!! So much light and room. I am very happy for you! Now I would sit back and enjoy!! i love it so much i want to move over. really, it looks great, i love what u [and family] did with the place. Karen, Just absolutely a place where you can go and have FUN!! I love it, can I come over and play? It is just amazing and to see some of your tool time hints is fantastic. Best of luck and wishes for you in this wonderful respite! 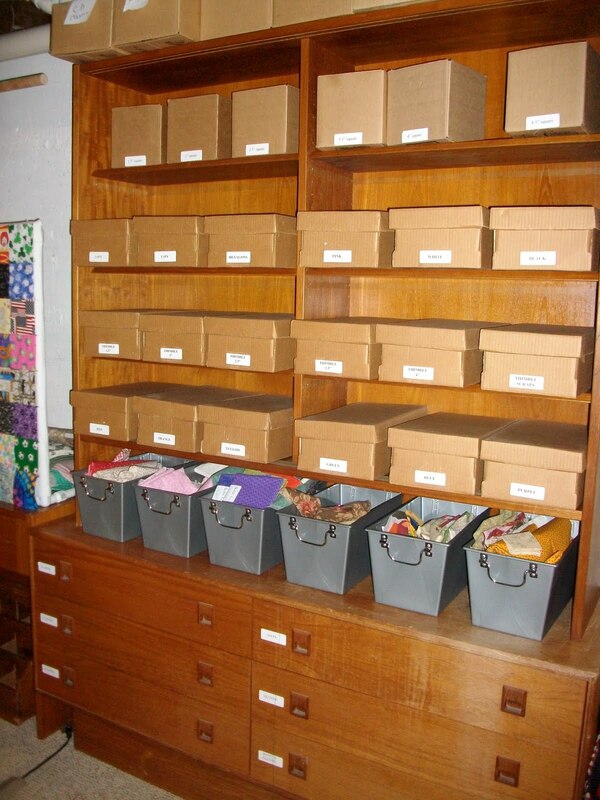 Lovely, gorgeous, organized sewing/craft room. Can you just see 99% of your followers turning green with envy? Lots of work to get that ready, but WOW! Good luck with it-- and yeah, keeping it that way. How nice to have the space. Enjoy, enjoy! Your new sewing room is amazing!! I love how everything looks together. You are SO organized!! have fun in your new room! What a fabulous studio. You should submit the photos to Interweave Press for one of their studio magazine issues. 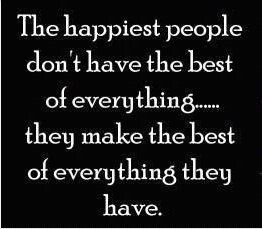 It's better than a lot they have shown. It's gorgeous and I am sooo jealous! okay...I could live in that room...are ya taking reservations? Enjoy your new sewing room. It is just beautiful. Sensational - must get back to take in every little detail! So much inspiration in that room you did! 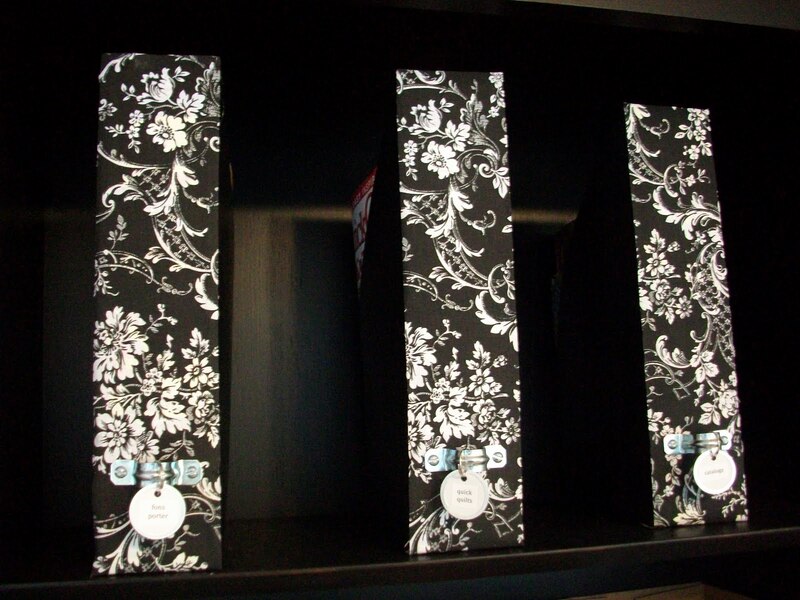 I especially love the water bottle boxes! Un maravilloso cuarto de costura. Te ha quedado precioso, y súper amplio. El sueño de cualquiera de nosotras, y qué fantásticos ventanales. FELICIDADES!!! What a project! And the result is just stunning! You have used your space and storage units so well, and I love the way you painted everything to bring it all together. What a pleasant place to create! I'm just wondering what's going to happen to the basement!? I love your new sewing room. Painting everything black really pulled it together. I really need to do something about mine and will steal some of your ideas to help me turn mine into something more presentable. Wow Karen, your new room is absolutely gorgeous. I love the black, white, galvanized look....any other color would look great with it. You really got a lot done for only 1 month. That had to be hard on you....unplanned renovation...eekkk! Have fun and enjoy your new room! What a beautiful room to work in! I love it and all the black is so elegant. THanks for sharing and I hope you have LOTS of great fun in your new "happy place"
What an incredible room! The entire room looks great. You must spend a lot of time in there. The fridge sure looks great too--doesn't look like a fridge. I'm so happy for you that it is done! Karen, It's fabulous! I'm so jealous of all the space yo have. Thanks for the tour too. THIS IS B E A U T I F U L, I cannot believe how gorgeous it is!! There is a scripture that says "all things work together for good", and you have to believe that in this room! I'm so happy for you, Karen. problem works out well, too. BTW, my husband's comment was "Look at those windows, look at that view!" Karen, as I sat here i n awe reading your post and adoring your amazing sewing room I nearly embarassed myself by starting to dribble as my mouth dropped further open. I would so love a room like yours, its heaven on the ground. 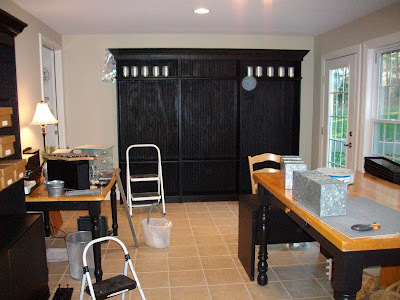 Your new sewing room is amazing...love the colors and the black painted funiture. The letter words are so cute. It is simply gorgeous AND sooooo organized. What a delight it will be to sew in that room with all of the natural light. OMG your room is gorgeous! 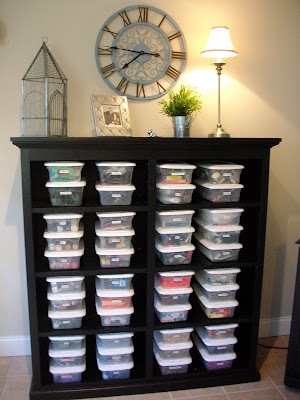 I absolutely love all the organization and how you have recycled all things into storage--like the water bottle containers and the cereal boxes! Love the tables too! I wished you lived close to me--I would have you help me out! I am really tempted to flood my basement just so I could have an area like yours! (Minus the sewing machines and computers though. Fantastic job, enjoy all of your creating and quilting in your beautiful room! Oh My Gosh! I love, love, love your sewing room. I haven't been reading your blog very long, but certainly do enjoy it. This room is stunning...what work you have done...and after going through all of that I'm so happy for you that the results are phenomenal...a phenomenal sister you have, too! Sorry about the flood Karen but WOW - you have one fantastic room there that you and your sis created! It's amazing what a can of black paint can do to make everything come together and just create the perfect simple backdrop for all your creativity! Thanks for sharing our beautiful space. Love that wall of windows in there too!!! It is amazing what how paint on furniture can tie a room together. 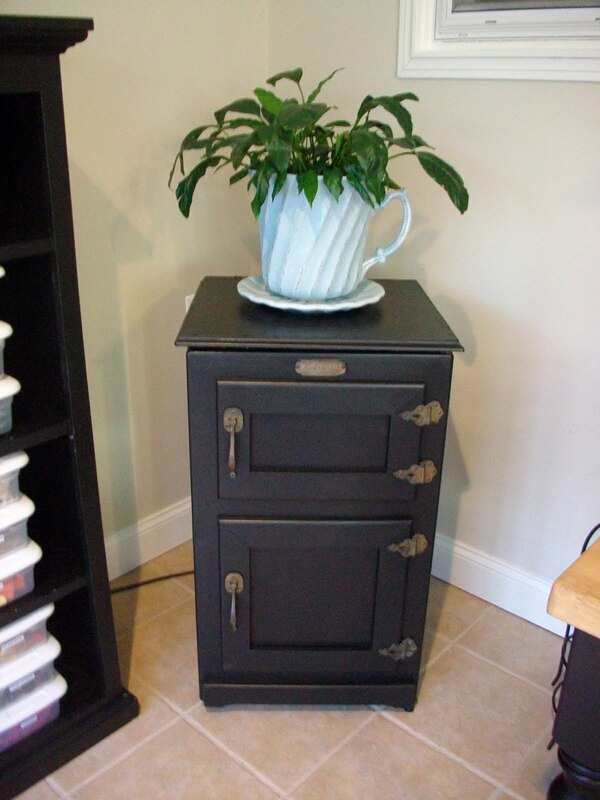 Old furniture takes on a new life. Wonderful transformation. Good luck with the insurance. Look forward to the next TTT project. You're so clever, talented, ingenious-minded, and with that you are kind, humble and gracious. You are a beautiful person and deserve the best of everything. Please give your sister (and niece/husband etc) a big cuddle from Vikki-in-Australia. They have been wonderful haven't they?! Bless you sweetheart, I am so incredibly pleased for you!!!! And when in the future I get a studio space of my own... I shall visit this post again for inspiration! Gosh - this is an essay! Sorry! 'Jealous' doesn't begin to describe my feelings right now. Well done for putting so much hard work it. And lucky you having such a wonderful big space to work in. wow, the room looks fantastic!! and to think you have managed to keep your sanity as well after five floodings - I'm impressed!! WOW Karen, your new sewing room looks fabulous!!! Enjoy your new room...you deserve it! Karen, where as others would have curled up and given up, you have raised to the challenge and out done yourself! Congratulations on the new improved sewing room - STUNNING! 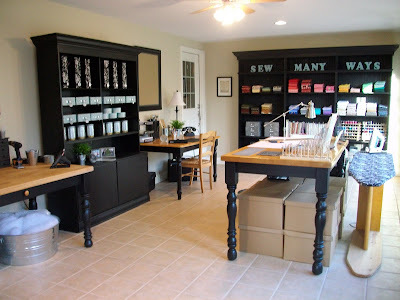 What a lovely sewing room Karen and such a great sister to help you get back into a sewing room where you'll have many fun hours of sewing just a little jealous would love a room all to myself like that!! What a beautiful room - and a great job at making it multi-purpose and flexible to use for those big family 'do-s'. Enjoy, enjoy - it's going to be a wonderful work-space, especially with all that light!! Wow! What a wonderful workspace. You have a fantastic sister to help you out, too. The crown molding really lends a nice element to the hutch and bookcases. Lots of light and a beautiful view with those windows. Looking forward to seeing what wonderful things you create in such a beautiful space. First, bless you for your patience with your Father. Next - Wow - your sewing room is amazing. 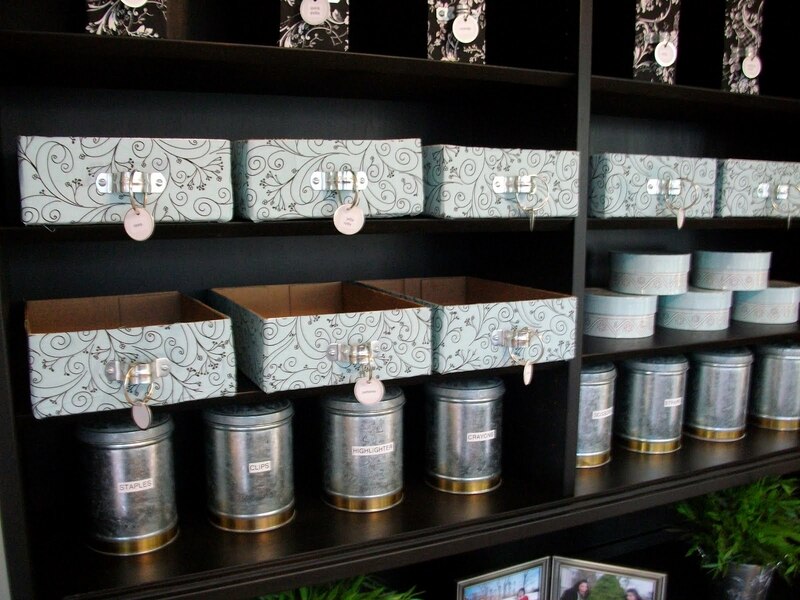 You have so many great organization and storage ideas. Some day maybe I will have some of those! Bless you for taking care of your forgetful dad. You are earning stars in your crown. I'm sure you do it out of love, but it still isn't easy. This is the most beautiful sewing room I've seen, honestly, I love the black especially with the natural wood. Your sister is a gem helping you. Thanks for showing the process. And enjoy your new room. Karen, my dear, I have one word for you.....CLASSY! I'm so happy for you! Thanks for sharing! Your new sewing room is wonderful.I can't wait to see some of the great projects that come out of there.I am glad things are working out so well for you.Bless your sister for being there for you.Thanks for sharing. Oh My! What an amazing room you ended up with..almost makes me wish I would have a flood..but then I don't have a sister like yours. My sewing room is so full of stuff I can hardly get in it. I am so happy everything turned out so nice for you. I know it was a lot of hard work but the results are wonderful. Hola que maravilla de habitación para la costura. !Very pretty! What a supremo roomo! I love what you did to update those bookshelves! It all looks so pretty and inviting!! Love your creative style!! You rock!!! Oh....My....Goodness. It turned out fantastic. What a lovely room size and the windows and natural light are wonderful! You ALL did a great job. what a gorgeous room, I am very envious of it, well done!! Wow! that is a wonderful space ~ love the color scheme! It looks like a great place to work on projects and the view to the outside is terrific. Oh my goodness Karen, it's just beautiful!!!! I totally love it. Enjoy it!!!!! Your new sewing room is sooooooo cool,Karen. Enjoy sewing! What an incredible room. You will have SEW many wonderful hours of creativity, fun, relaxation, you name it in your new space! It is nice to find someone similar to myself - the great organizer! I too, love to label everything and have it all in its place. I get called OCD all the time! But, it is the only way I can function. Please visit my blog at www.lalabymona.blogspot to check out my studio and a giveaway! Enjoy your new room and have a Happy Thanksgiving! I am just totally speechless... what an incredible makeover. I love it!!! Congrats on your new sewing room Karen! I love the natural light! You guys were very busy! Great job! I only wish I got that first class sewing room when my basement flooded. I'm so jealous. I'm so glad it turned out so well...it has to be fun to sew in there especially with all those windows. Simply awesome, and thats just the room but the added bonus is a sister with a vision and molding, wow! Love it all but more than anything the widnows all that wonderful light, is your Dad free to come to my house I would love to re-do somethings here? I read your blog regularly. Wow,your sewing room is fabulous. I love the huge window for natural lighting. I think crafty people can do wonderful things with rooms. Can you come decorate my home? Wow this is lovely. 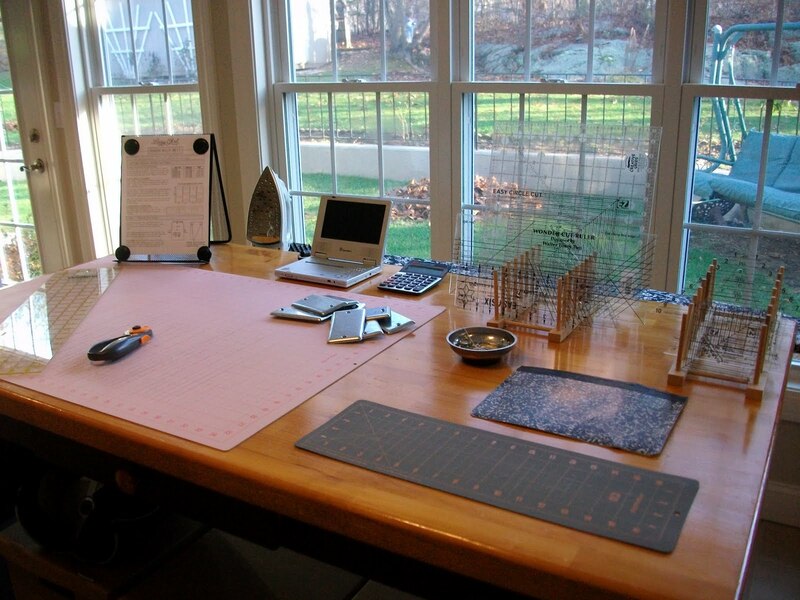 Your sewing room is now so beautiful it needs to be published in a magazine. And so organized. 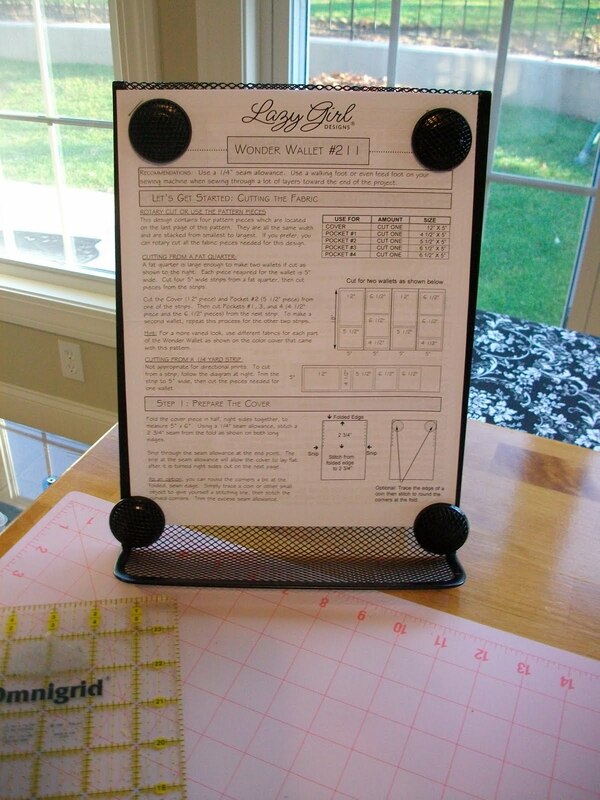 I also love the ideas you shared, like the magnetic holder to hold your project instructions. 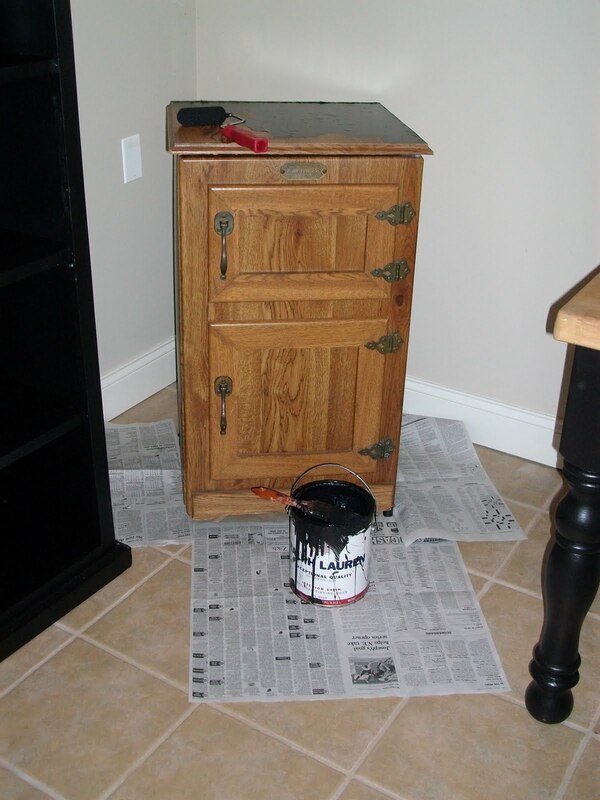 What type of black laquer paint/stain did you use? You've inspired me to paint my bedroom furniture black! 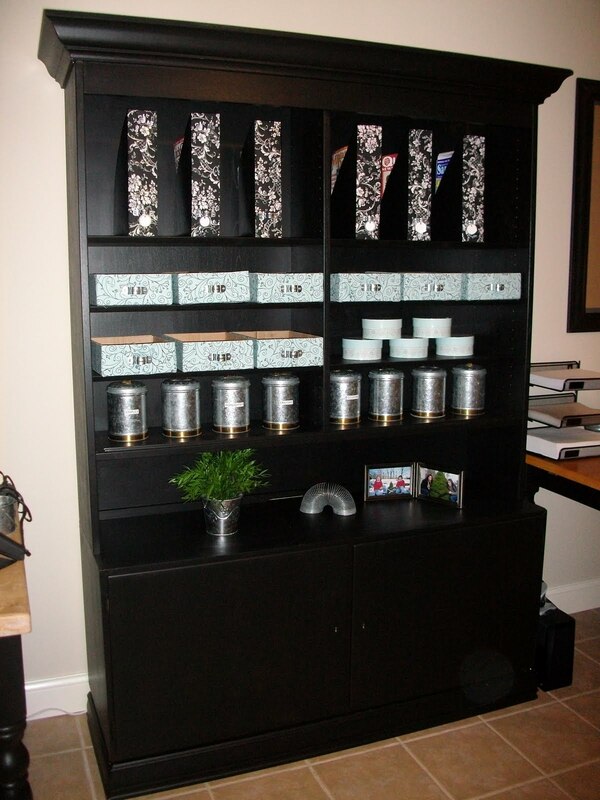 I am so impressed with your new sewing room...and a little green with envy! 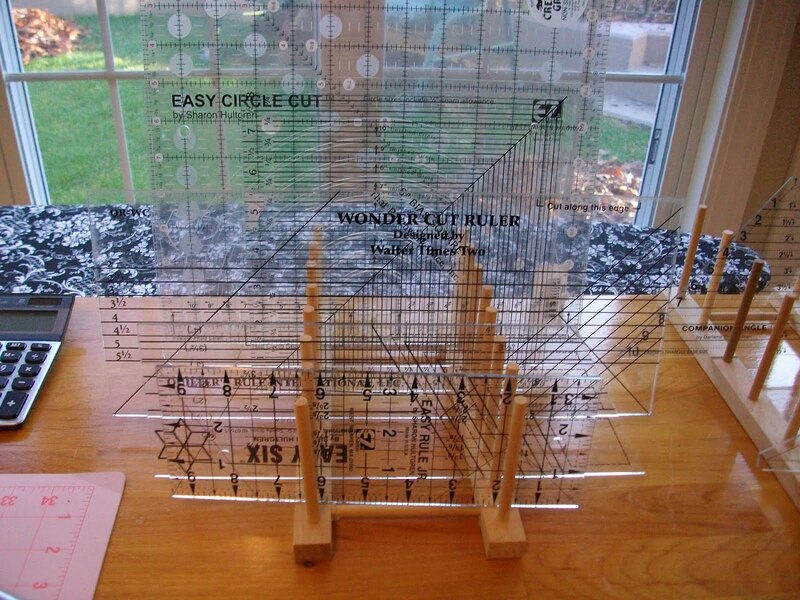 However I am going to steal some of your wonderful ideas....the magnetic board for patterns for one...and I really really need a dvd player like yours....honest!!! 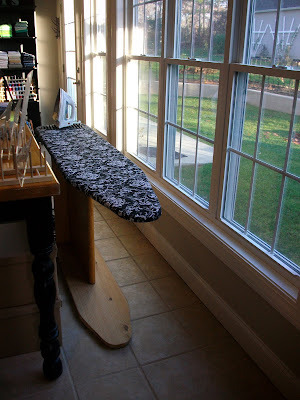 This is one of the most amazing DIY sewing rooms I have ever seen!! You and your sister worked wonders!! 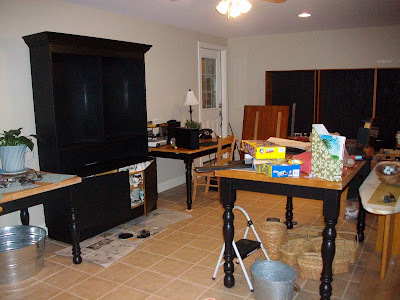 I am in the process of redoing my sewing room and I am getting ready to paint some furniture. Thanks for the inspiration!! I love the added molding!! WOW! You took an awful situation and turned it into something fabulous (lemonade from lemons)... with inspiration and ideas for us all! GREAT job! Your room looks awsome! I could use some help to organize my space. Have fun! What a wonderful space- I love all the special details you have added to make your space unique. It is certainly one of a kind. I hope that you enjoy many happy hours creating in such a beautiful space. What a great sewing room! Nice job. You and your sister sure have the touch. What a wonderful room, love the black paint. It's a gorgeous space for creating. Your sister is GOLD! You lucky girl to have such wonderful, creative support! Good luck with the refit of the machinery! Your room is WONDERFUL !!! will you come to my house and fix my sewing room....Happy Thanksgiving..
That is a to die for sewing room!!! Those big windows would be so awesome for the light coming in. The plate holders for the rulers, another awesome thing. Amazing what you can see and learn from great bloggers. BEAUTIFUL!! Can you do me a favor and measure your cutting table top for me?? That's the size I would like and my husband is willing to create it for me but I don't have dimensions for the top. The one you are using is PERFECT! 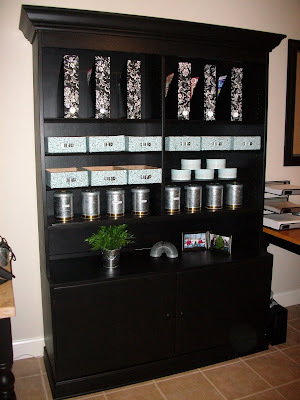 What a wonderful sister and family you have to help you create that gorgeous sewing space! That room is BEAUTIFUL! If that were my room, I'd never want to leave! So, so pretty! Your idea to refurbish the bookcases is so clever. Thanks for sharing all your wonderful ideas. Hope you enjoy countless hours of creativity in your new space! Wow! What a great space.... I hope you enjoy it, and get many years of 'flood free" sewing... thanks for sharing. I don't know how I missed this post....but I did. Fantastic !! So much space ! I'm lost for words..... Well done ! Amazing space. Simply amazing. Something to aspire to, I suppose! I'm speechless. Totally Wow. Simply Awesome. Thanks for the update on your new studio space! I looks wonderful. Enjoy! OMG! OMG! OMG! You are a genius!!! Do either you or your sister hire out? It's nice and sunny here right now! Not too hot. LOL! divulging where you got those? Also, I'm wondering how well those cereal boxes hold up. Oh, and I don't know all the issues with your father, but cherish (as I'm pretty sure you are) the years you have left with him. That is an incredible sewing room. When I get my own I will have you come decorate it! I love it! I received my swap fabrics today and love them!! Thank you so much for hosting!!! You have a beautifully coordinated sewing studio. The black paint on the furniture sure looks sharp. Happy designing and sewing in your new space! OMG It is gorgeous, and sooooo lovely tht you have those great windos. I am jealous, no happy that you have sewing room back in order. That is an amazing sewing space and YAY for reusing so much. Amazing what a little paint and some hard work will accomplish. That is such a dreamy craft room. Organized to the "T" and beautiful at the same time. I am inspired!!! Wow, all I can say is that I am drooling over here! Your room is so beautiful, organized and inspiring! 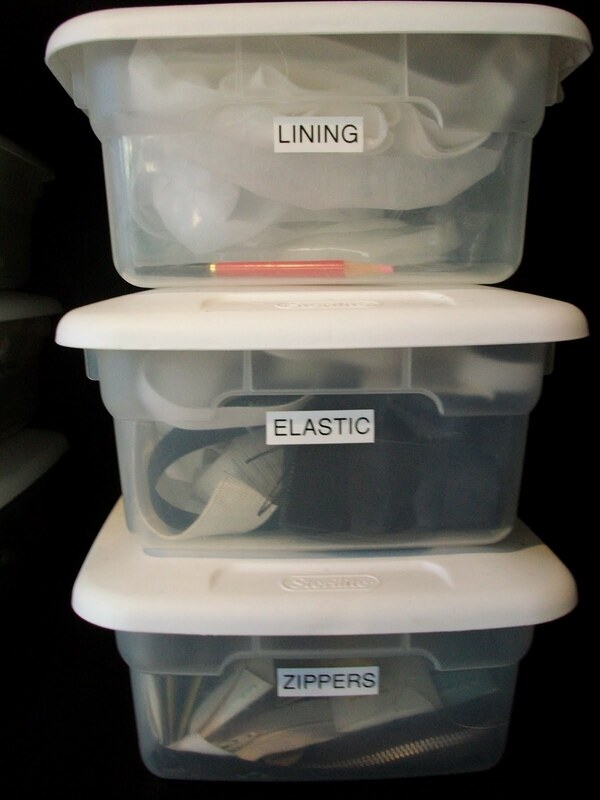 My heart just skipped a beat when I saw that shelf with all of the matching labeled shoebox containers. Pure, lovely calmness. 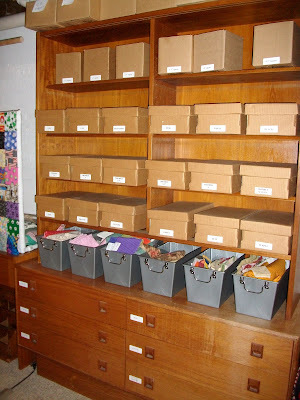 i'm just getting around to organizing my sewing room and linked to your blog. your room is amazing---the colors, the windows, all your great organization. love it!!!! 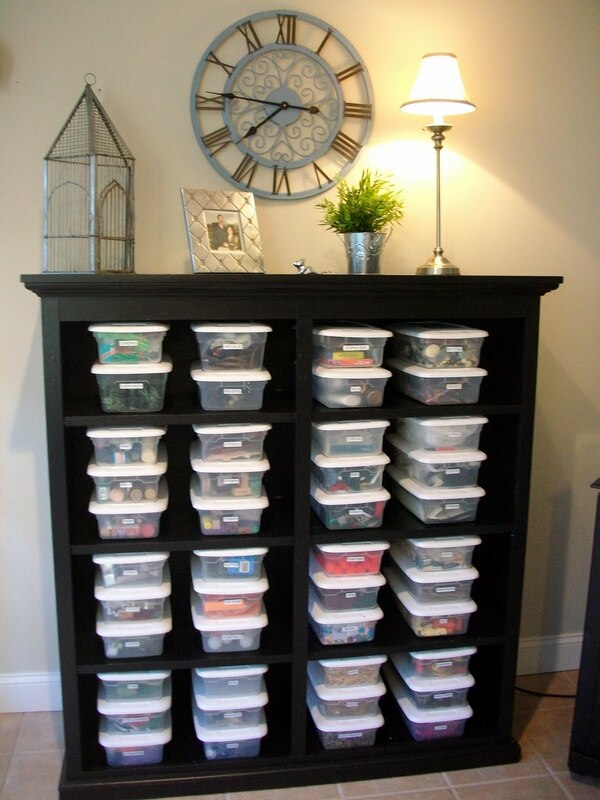 That is just so amazing, and so inspirational and useful for those of us (like me) who are currently redoing a studio/sewing room. Thank you so very much for sharing! This room is AMAZING! The best part is when you break it down and we can see that you started with regular stuff--and not even the incredibly price-y regular stuff. Thanks! And I hope you are enjoying this incredible and incredibly beautiful space! Beautiful, it looks amazing and so neat! I know I'm not supposed to covet...but I'm really struggling here! This is A.MAZ.ING! 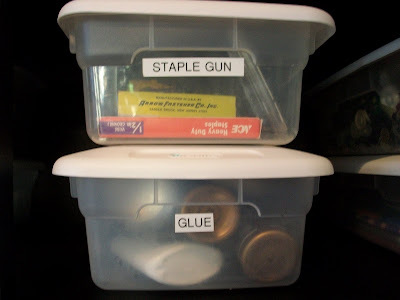 I am getting ready in the next few weeks to create a craft room in our basement. This one is definately going in my idea file! You did a fabulous job. I would never want to leave that room. I love the fact that not only is your space spectacular and screams 'Pottery Barn'!!! It is actually recycled ugo furniture screwed and painted into the perfect clone. At first glance - spendy. Close-up - Thrifty! I LOVE this room! I don't have a space yet for sewing/ crafting, but this will definitely be my inspiration! Did your hubby make your ironing board? I have never seen one like that. I have to say it looks sturdy! 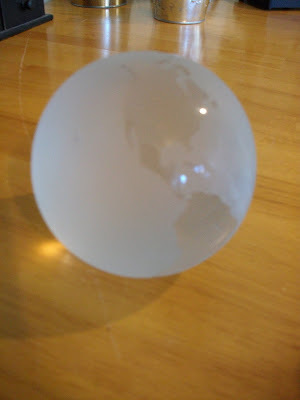 Could you tell us how it was made or where to get one? I had to tell you that I listed your sewing room on my fb describing it as my inspiration for my re-do...well, apparently not too many read my description and thought it was mine! I got tons of compliments! I am looking forward to finishing my room with all of your inspiration! Utterly stunning! What a blessed woman you are! My mom directed me to your blog. She wants me to organize her sewing room. I am just about finished with my office/scrapbook space. I think you will be interested to know that for family gatherings, I will also be transforing my space for serving purposes. My space is traditionally the dinning room, but we have a large breakfast and don't need a formal dinning space year-round. 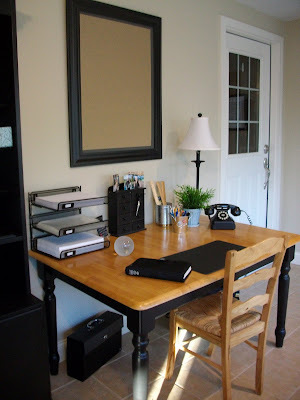 I like the black that ties together your furniture, a welcome change from the traditional white craft room. I would love to know more about the painting technique and finish. Did you sand and prepare the wood surfaces? Or did you just paint it as it was? Did you brush or roll the paint? Is it flat, satin or gloss finish? Did you add any top finish after the paint? Obviously, I would like to mimick your design! Wow!! Your room looks super and your post was so full of good tips! Thanks for the inspiration. Great ideas just love the room. Wow your sewing room is beautiful. Did you prime before painting or just straight paint? 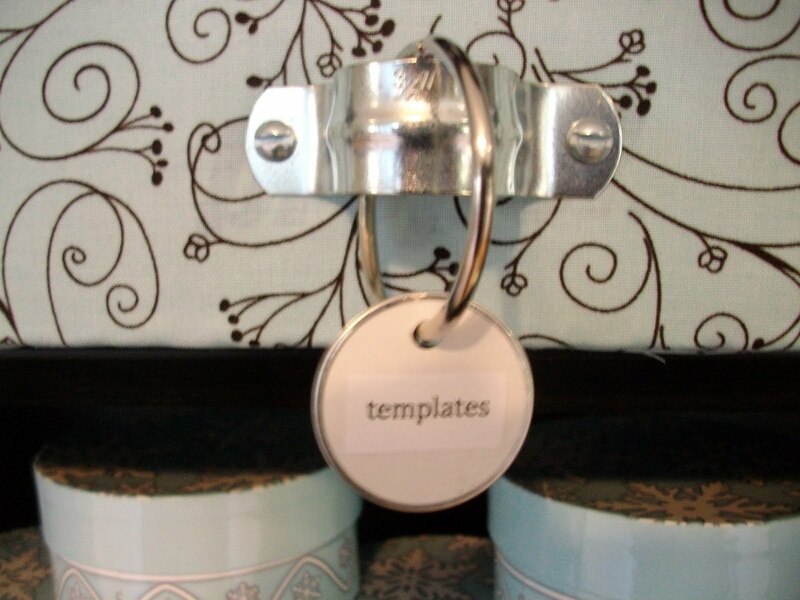 So glad I found your room, because I am going to shamelessly steal some ideas:). I can't wait to finish a room that I am working on. I will link back to you for sure when I post it. 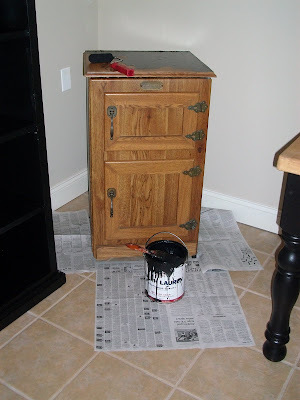 Did you use primer onthe laminate or just paint? Getting started on bookcases soon and thought you might have advice. I recently discovered your blog and have fallen in love with so much of it. I am glad that you have the crafting to give you peace. My mother died of Alzheimer's almost 4 years ago, so I can relate to a lot of what isn't said within your posts. Bless you and I love your reuse, reduce, recycle, repurpose attitude! unbelievable!! just found your blog while looking for inspiration for my new scrapping/craft space. i am amazed. your use of crown moldings...brilliant!! i am rethinking every idea i have had until now. bravo!!! Absolutely stunning! 3 years later your room is still inspiring. :-) I wash I had that much space and natural light, but hey creativity thrives under most conditions, Lol. Thanks again for sharing, it's beautiful! I found your site a few weeks ago and love it!!!! Wow what a little Black paint can do for those cheap book shelves. I am inspired, my husband better look out I see alot of black paint in his future lol. Love your tips, love out of the box projects. Keep it up! Found your site a few weeks ago. Thank you for sharing!! I recently lost my sewing room when I had to move to a two room apartment. While I love my new home, I don't have room for a sewing room - almost don't have room for my sewing machine :( Your room is now on my desk top! I love it. What a beautiful, organized room. The re-do is so inspiring. Thanks for sharing! I just found and read so much from your entire web site. I am planning on building my sewing room and I am sew excited now after reading your tips and advice. Thank you so much for taking the time to share your ideas with us. 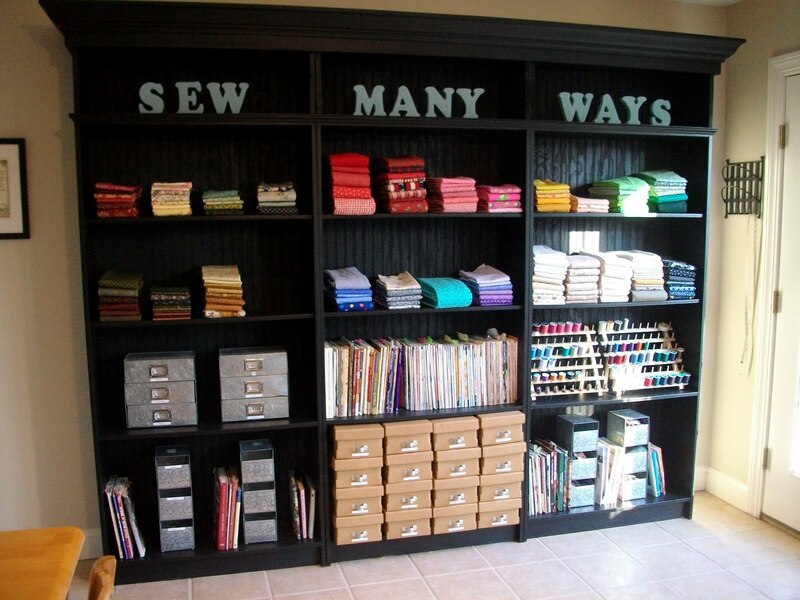 Wow.... O_O That is my dream sewing room. Thanks for posting. I'm definitely going to start working to build a room like that. You even have my favorite colors and the big windows, bah so PRETTY! Ok must get to work...have fun! LOVE, LOVE, LOVE all ur ideas! My fav is the shelf with all the shoebox size rubbermaids. Just curious, what type of furniture did u use? Is it 2 book shelves or a cabinet of some sort? I looked all over ur site to see if there was any mention and I'm sure I missed it because u seem to have covered every detail! Ur response would b greatly appreciated. My sister and I are both going to make these for our homes! Love it! Just finished my sewing room too and couldn't be happier. Check it out if you'd like at wwww.debbiebruns;57.blogspot.com I am new to the blog posting but catching on quite fast. LOL Have a fantastic day! Are the shelves that you replaced the backs with bead board made of solid wood or are they some kind of composite material? If they aren't wood, what are they and what did you have to do to prep them before painting? What a beautiful workroom!! I would love to know how you prepped and painted the bookshelves as well. Blessings! Gorgeous and very functional! Wanna come help me get organized this brilliantly & beautifully? 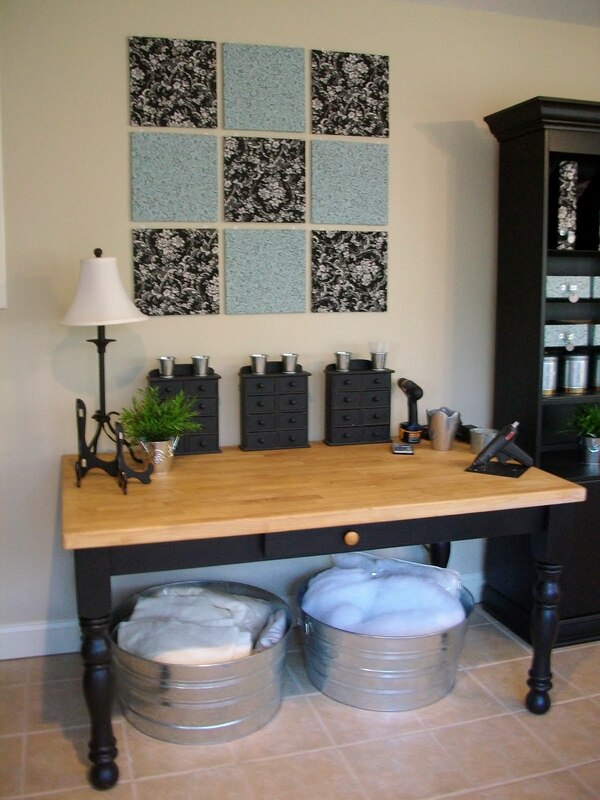 Your sewing room is fabulous. I am just getting started. You have inspired me to want to get my finished. I have temporarily stopped so I could work on my crafts. I have only one end of the room to finish organizing and going through all the large totes of craft supplies. My sewing room was a garage at one time converted into a bedroom. Will try to keep a bed or daybed for company but hope to get it more organized to use for my crafts.